EquipHotel 2018: Suspension Lighting Pieces You Should Know About! EquipHotel 2018 will began soon! So let’s talk about Suspension Lighting Piece that will be there! EquipHotel 2018 is just around the conner, for that reason if you are thinking about visiting Paris, you should take a look there! Brubeck Pendant Lamp will have his spot at EquipHotel 2018, we all know that he is a bestseller, side by side with all Brubeck Family. Dave Brubeck as always been an inspiration to all of us and this lighting piece is the reflexion of that. 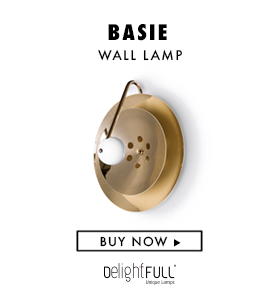 Handmade in brass, it has a gold-plated finish and it can be customized in gold, nickel or copper plated, brushed brass or nickel, and aged brass. Ike 13 Suspension Lamp is a lighitng piece that can be the perfect choice for your dining room lighting because of all the lighting focus that he has. Ike is handmade in brass and aluminum and features a glossy black and gold plated finish, representing a high-quality craftsmanship. Ike Pendant Lamp is another way to have this lighting piece, on it’s own! Another proof that you have the possibility to customize all. All the colours and all the materials, how amazing this is? At EquipHotel 2018 you will find it! Ideal for industrial kitchens, dining rooms, restaurants and bars, this copper pendant light it also looks great as a bathroom suspension lighting with a mid-century modern decor. All in all you can have in any place at your home! Madeleine Suspension Lamp is unique, it’s uniqueness can be see if you visit EquipHotel Paris! Handmade in brass, this pendant lamp features a matte white interior and a gold powder paint inside finishing. Are you thinking about visit Paris? You know where to go then! EquipHotel 2018 will also welcome our Matheny 3 Suspension Lamp , luxury and class is what we can see in this lighting piece. So, if you’re looking for this two characteristics in your dining room lighting, here you have the awnser. You can visit our Pinterest boards in order to get more inspirations for your dining room lighting. Get more ideas for your projects and find functional, stylish and sizable lighting and furniture choices. Make sure to download our ‘Interior Design Tips for a Well-Lit Home‘ eBook!